After spending 2 weeks in Mexico City, we thought Antigua might be a nice small town for some down time. Boy were we wrong! Indeed it’s a nice small town but down time…? Notsomuch! We have been busy every day exploring the area, taking tours and classes and learning learning learning!! And of course with travel, sometimes what you learn isn’t something that comes in a tour. There once was a man on a bike… But we’ll get to that later. 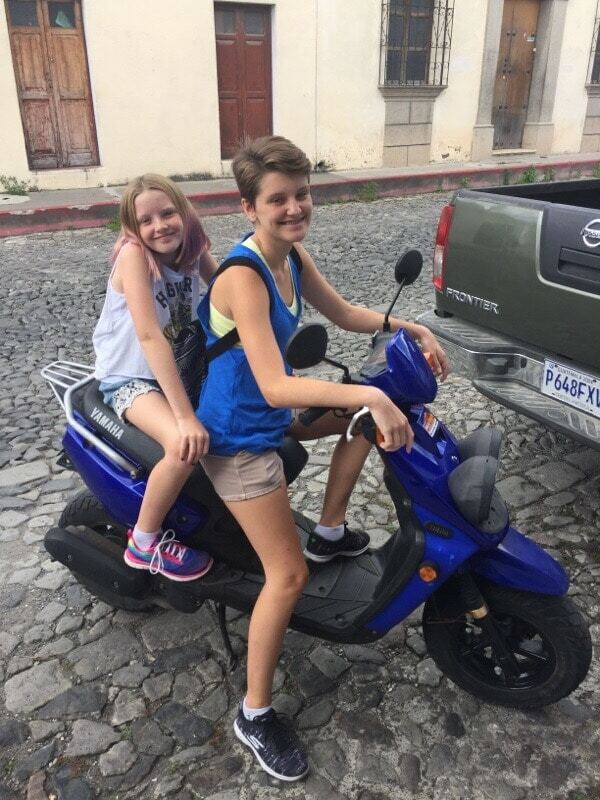 We enrolled the girls in a Spanish school for a week since our good friends from Oregon were here doing the same. When the kids showed up the first day the teachers had flash cards with basic nouns on them. We got a good giggle out of that. The girls are well past basic nouns and are pretty much fluent in whatever they choose to say. So they opened their mouths and the teachers were visibly surprised! The lessons were quickly re-adjusted and the girls settled in nicely. The school has every student working individually with one teacher, so there were no worries about grouping like-levels together. 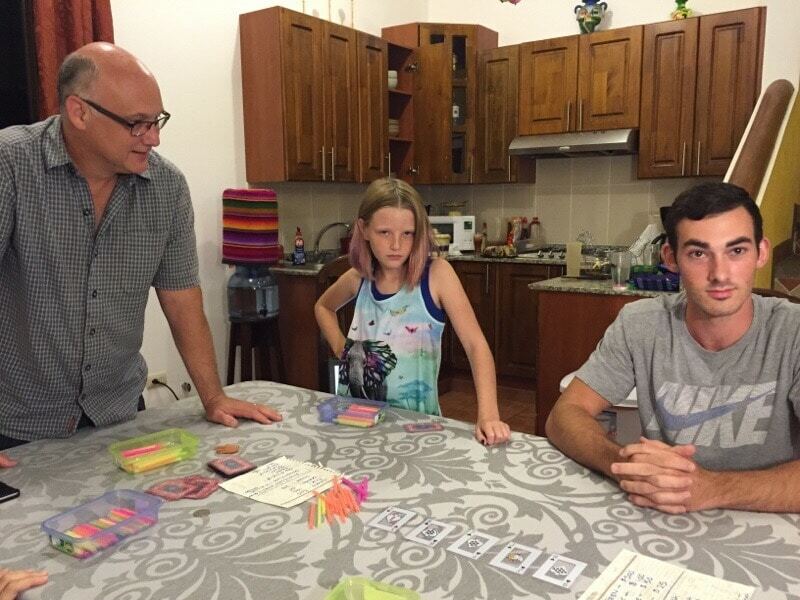 Our friends Jay and Aaron were busy learning too, and sometimes the girls were grouped with them for a few games. Haley admitted that even though she had to get up at 8 a.m. every day, she enjoyed having the routine again. I think she likes being picked up in a tuk tuk every morning by our new friend Soloman and being driven chariot-style to school. Haley has a penchant for small vehicles. The girls also discovered the nearby panaderia which has chocolate covered macadamia nuts so of course that is now part of the daily routine during the morning break. 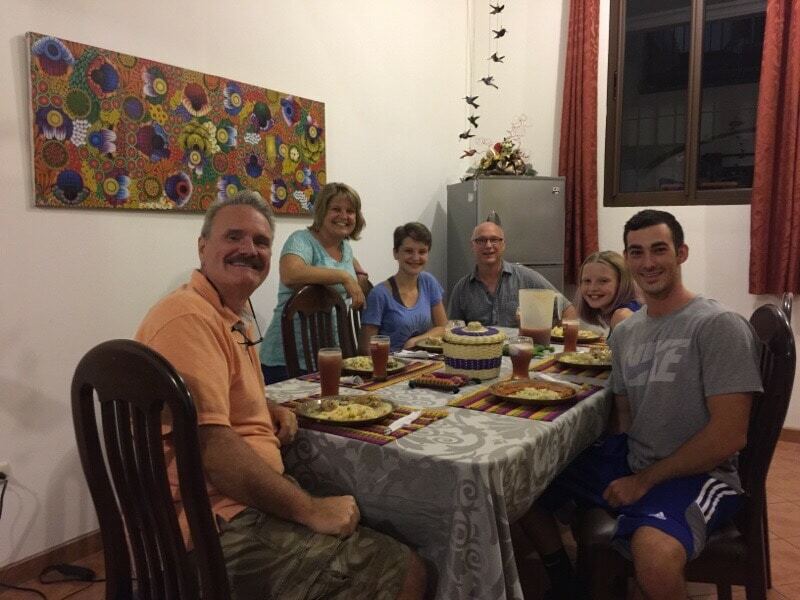 On the first night Jay and Aaron arrived we invited them over for dinner… a dinner our Airbnb housekeeper cooked for us. Es bueno. Super bueno. Aaron just finished a condensed year of physics at OSU in just 2 months so here he is explaining to Haley how the hammock works. We had enough people and cards to play poker. No poker chips? No problem! We used straws. We were all a little reckless with our betting. Plastic colored straws just don’t spend the same as real money. Zoe did not win, as you can see from her expression. Day 1 of Spanish school. 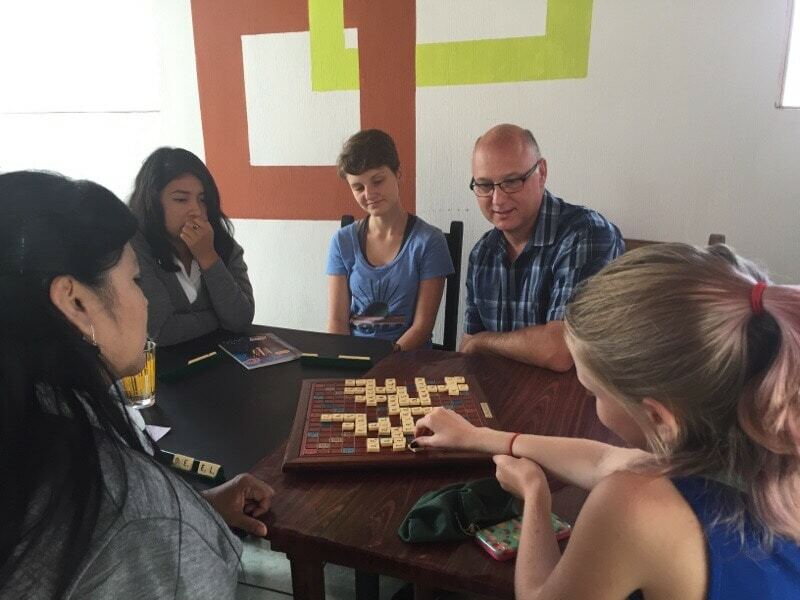 They put the teachers, our kids and Jay and Aaron together for a game of Scrabble. 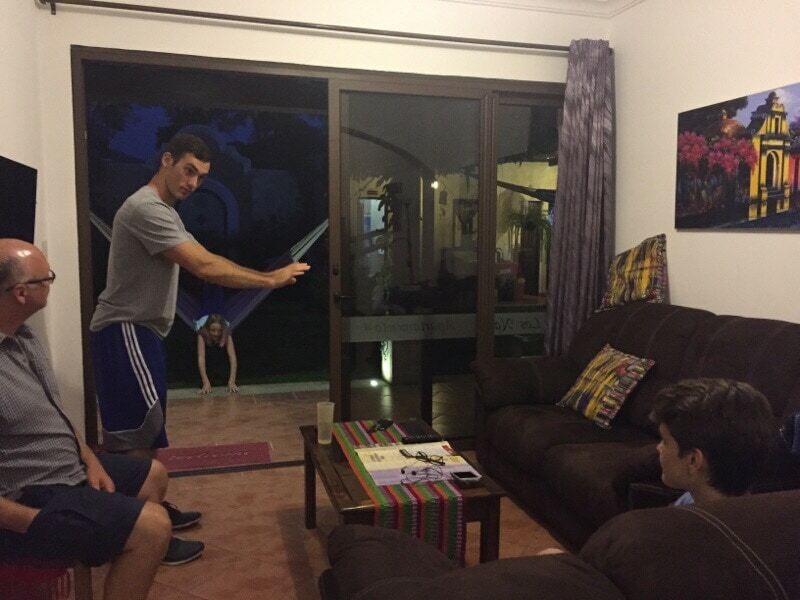 The teachers trounced the gringos. How is that even fair? The Spanish school organizes activities every afternoon for those people who would like to participate. 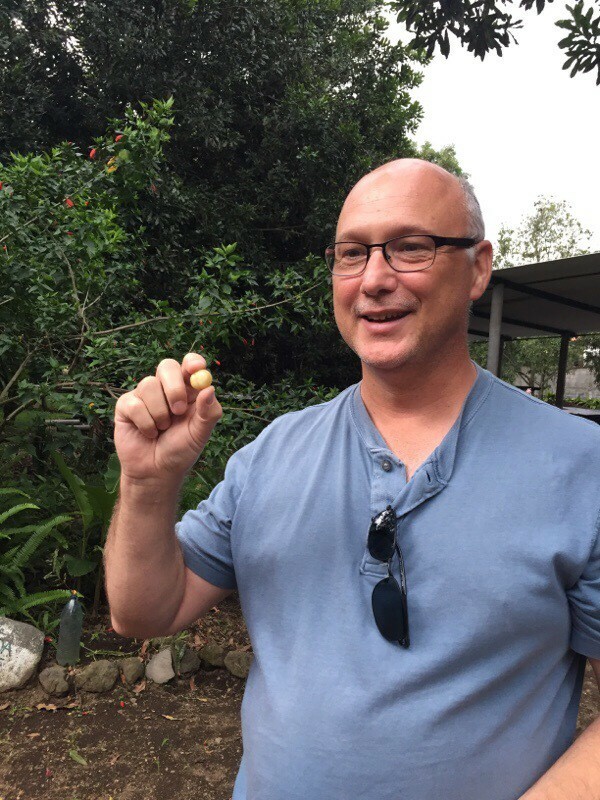 On Tuesday, we signed up for the coffee and macadamia nut farm tours. We met up at 2 p.m. with Jay and Aaron and off we went to a small town about 10 minutes away. You mean we are going somewhere and we don’t have to travel 45 minutes to get there??? Yeah, we are not in Mexico City anymore! Nor Cancun! Our guide came along and he spoke some English but it was a little hard to understand so after awhile we had him switch to Spanish. He spoke slowly and clearly and even Dan was getting most of what he was saying (coffee is not complicated). It was great practice for Aaron and Jay too. 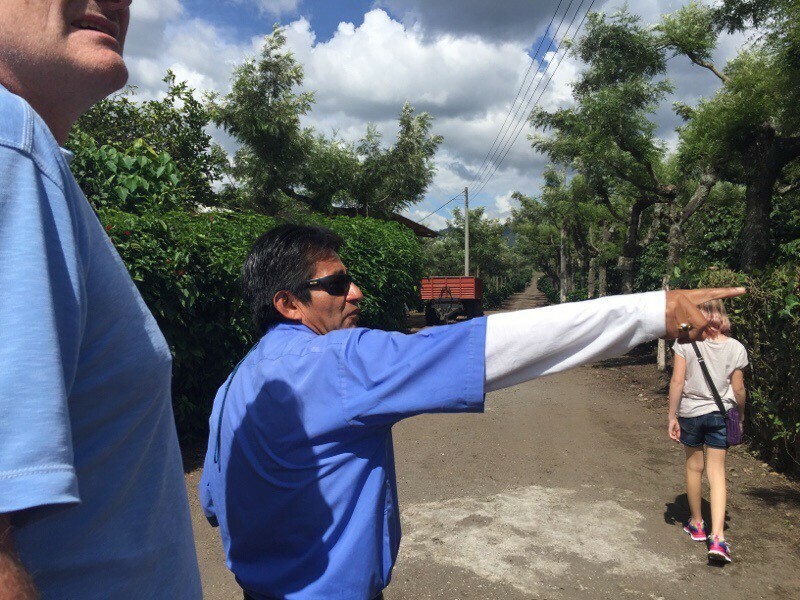 We learned all about the coffee growing process and how 35 families in Guatemala control almost all the coffee growing here. That’s both good and bad. They have a lot of weight they can throw around to the disadvantage of the workers, but without them it might be hard for a few smaller farms to export their coffee because they rely on the big family’s infrastructure. Almost all coffee grown in Guatemala is exported, mainly to Germany and Japan. Our guide said it’s too expensive for Guatemalans (Guatemaltecos) to drink. They drink “dark water” instead. 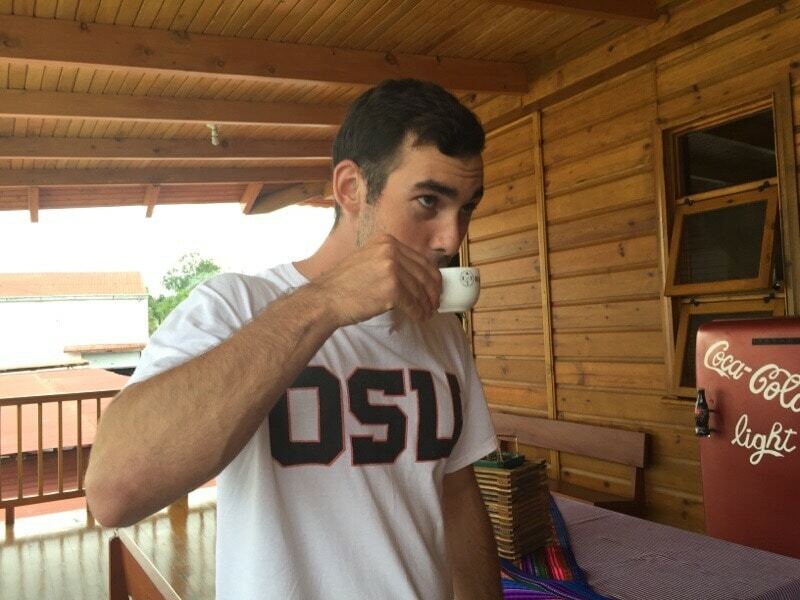 We were treated to a sample and bought a few bags of coffee from our hosts. It was goood coffee. 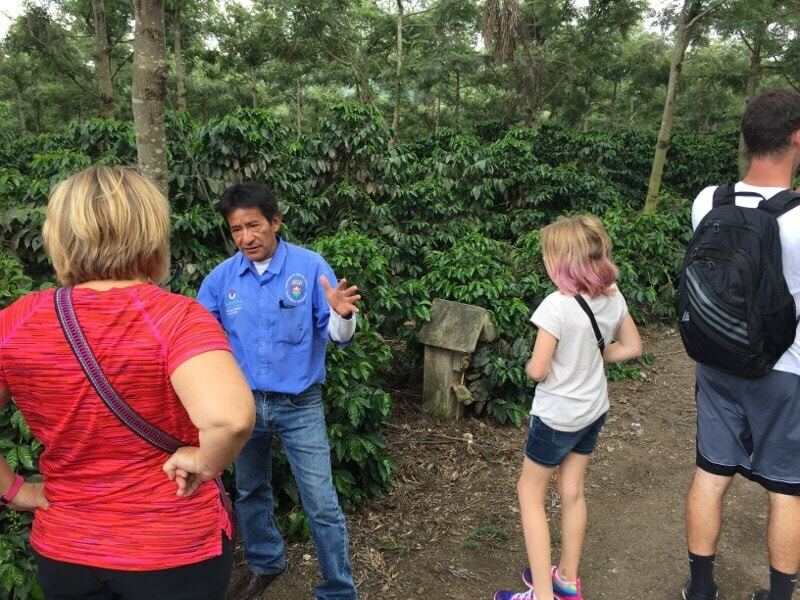 Our guide is explaining the coffee process to us. Aaron is enjoying the sample while simultaneously doing a brand placement for OSU. Then we went to the macadamia nut farm down the road. This was a much easier process and in fact you don’t even pick the nuts, you simply wait for them to fall off the tree! Our guide told us all about the oil that comes from the nuts and the many benefits it has, including protection from the sun, anti aging and for dry skin. Haley and I got a mini facial with macadamia nut oil and lotion and we were immediate fans. And of course the nuts themselves are delicious. 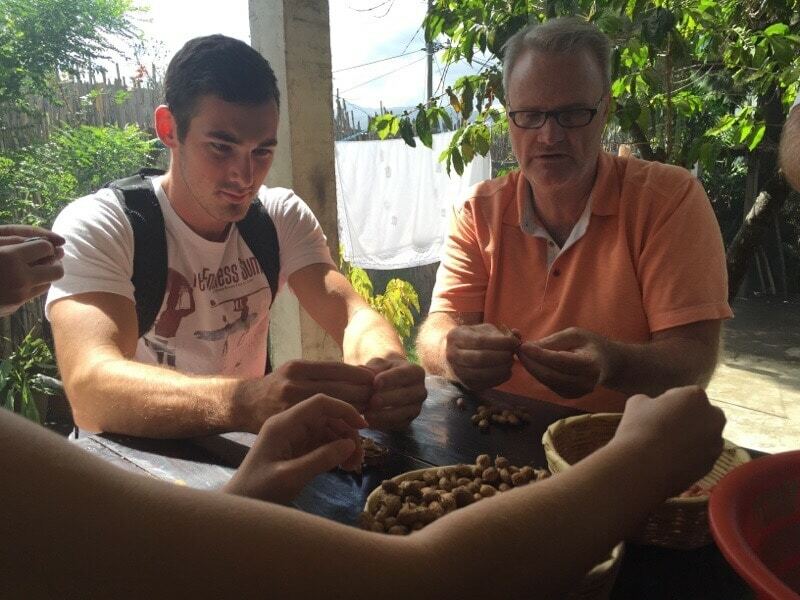 Turns out macadamia nuts are a relatively new crop in Guatemala but it was chosen for it’s benefits to the owners. 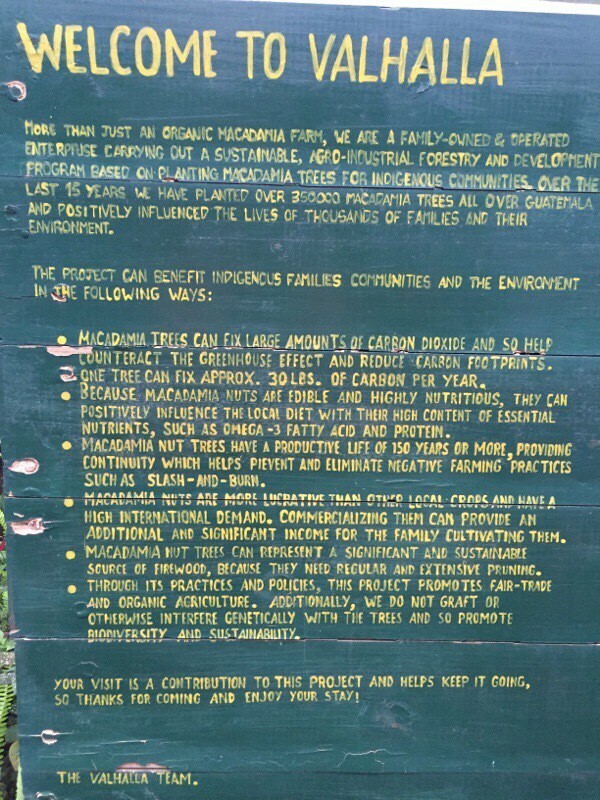 Long life cycles, minimal work, good nutrition and the trees provide great air cleansing too. Like there weren’t enough reasons to love macadamia nuts before! 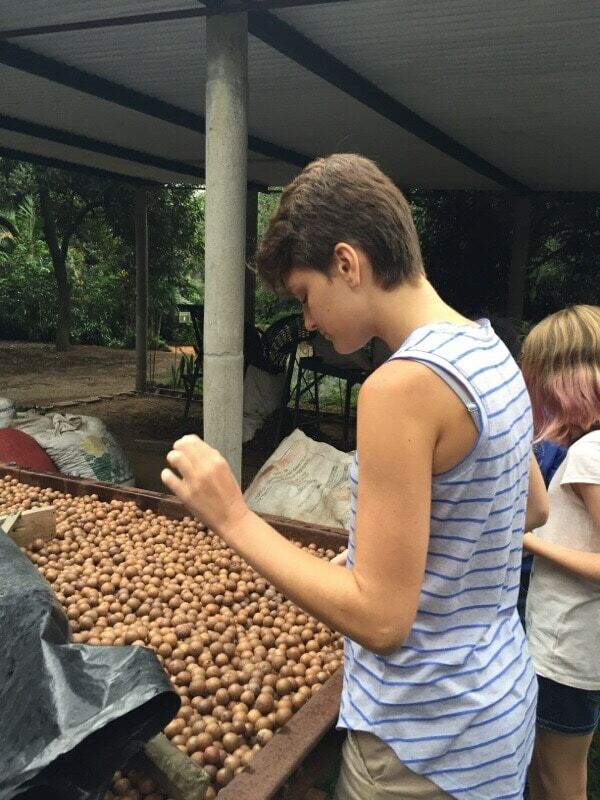 Haley checking the macadamia nuts to see which ones are ready. You shake them and if it “rattles”, it’s ready. 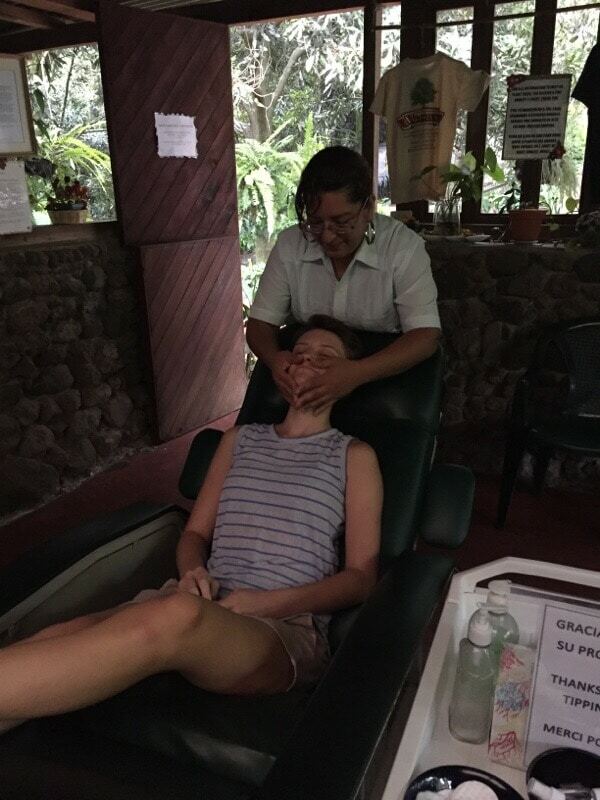 Haley is getting a macadamia nut oil facial. We invited this lady to Thanksgiving dinner we loved her so much. This explains all the reasons why macadamia crops are good for Guatemala. I thought it was fascinating. Who knew!? The next day we signed up to do a local tour with an organization called De La Gente (Of The People), which organizes tours to local farms, where the farmers explain their process and educate the tourists. The farmers share in the profit of the tour 50/50. We decided to do the Peanut Butter Making tour. Aaron is a vegetarian but also a tall guy who works out a lot so he was happy to think he might get in some protein that day! We hired a driver from the school to take us to the little town about 10 minutes away. We arranged to meet someone named “Lidia” in the main park and she would take us to her house. That plan sounds like it could go very wrong but in fact we pulled up, I asked someone who was standing around if she was Lidia, she was, she hopped in the van and we drove a few blocks to her house. It was a very small house, probably what you’d expect in Guatemala. But of course the people were so friendly. Lidia is 21 years old and is a student at the university, studying to be a teacher. 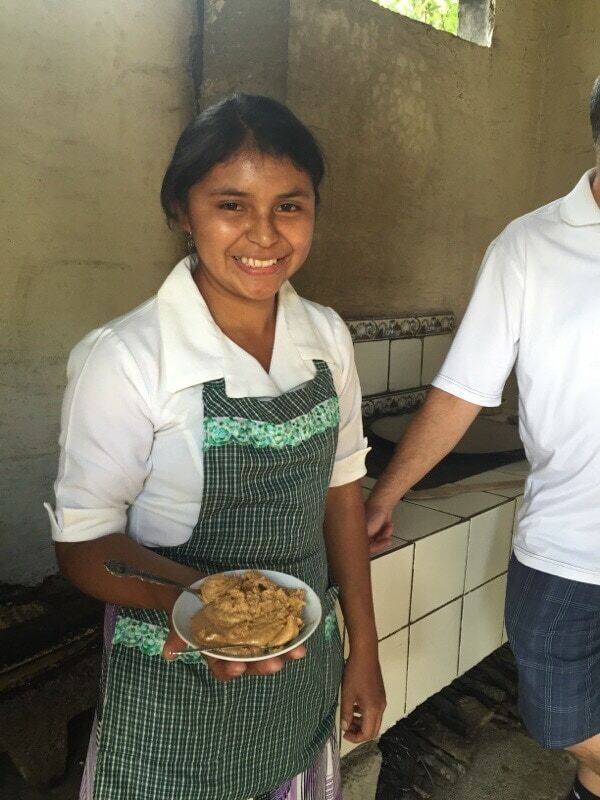 She arranged this partnership with De La Gente as a way to help fund her education. We fell in love with her at this point. Her father started by showing us the peanut plant, talking about how it grows, when it grows and how many you can fit in a plot of land. I had never once seen peanuts in their natural setting before but turns out they are just under the roots so when the plant is ready, you pull it out and under it you have all kinds of peanuts! Then the next time the rainy season starts you plant a new plant and do it all again. Rinse, lather, peanut butter, repeat! Their peanuts are an the smaller side but they are sweet and they are great for peanut butter. Peanuts are a hearty crop, being very disease-resistant. It’s hard to mess them up, evidently. 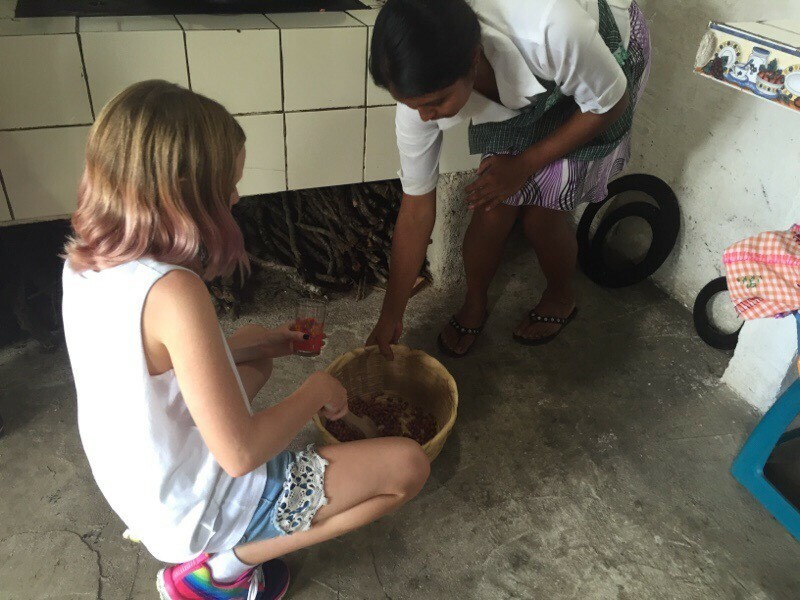 While we shelled the peanuts Lidia explained all about the process and then we went to toast them, shell them again and then it came time to make it into peanut butter. We thought we should add something during this step, like oil or sugar, but NOPE. This is PURE peanut butter. Ingredients: Peanuts. So we used a stone and a rock to crush our peanuts into peanut butter. AMAZING. It was so cool. It was a lot of work that surely Jiffy has fully automated, but this was really really neat. And then.. snack time! While we were crushing the peanuts Lidia had set the table with sliced bananas, warm flour tortillas and put out some honey. 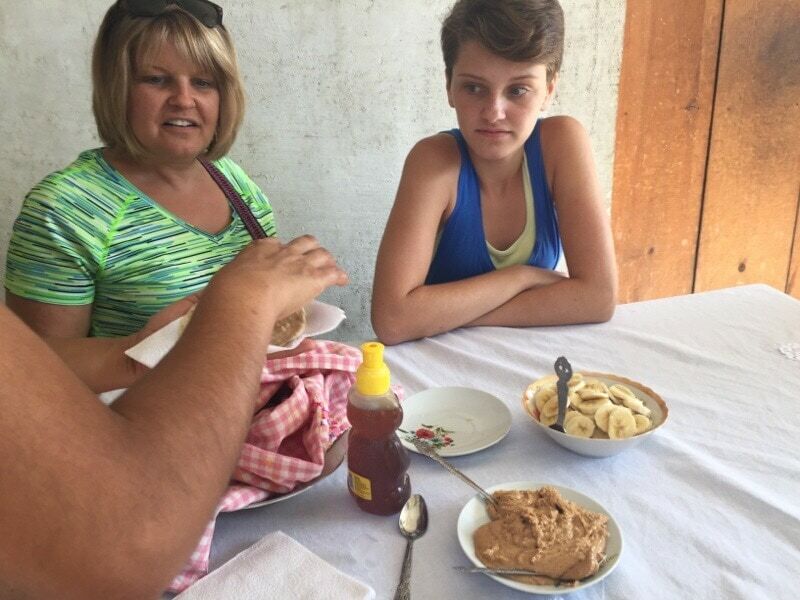 We ate our freshly made peanut butter on the tortillas with bananas and honey. Amazing!!!! We were falling all over ourselves with compliments for Lidia and how well she led our experience and how hard they all work. We all got a free jar of peanut butter with our tour, but Jay and Aaron bought a bunch more to share with friends back home. We all agreed it was a great experience. Sidenote: De La Gente offers quite a few other tours with local Guatemaltecos. They all sound so interesting: coffee farm, woodworking (the trees that shade the coffee plants are a very hard wood that are great for making furniture), iron works, making lotion and more. We wish we had time to do them all! If you are ever in the area we highly recommend checking them out. Lidia was very appreciative of the opportunity offered by this organization. 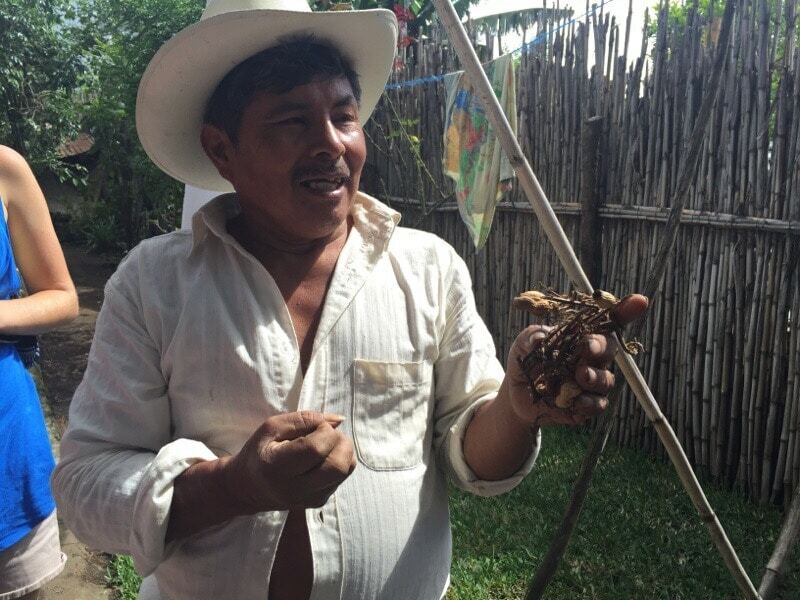 Lidia’s father showing us the peanut plant. Aaron and Dan shelling the peanuts. Dan ate about 50% of what he shelled. Cooling them down after toasting them. We have peanut butter! This is Lidia’s older sister. Delicious snack! Haley is drooling. 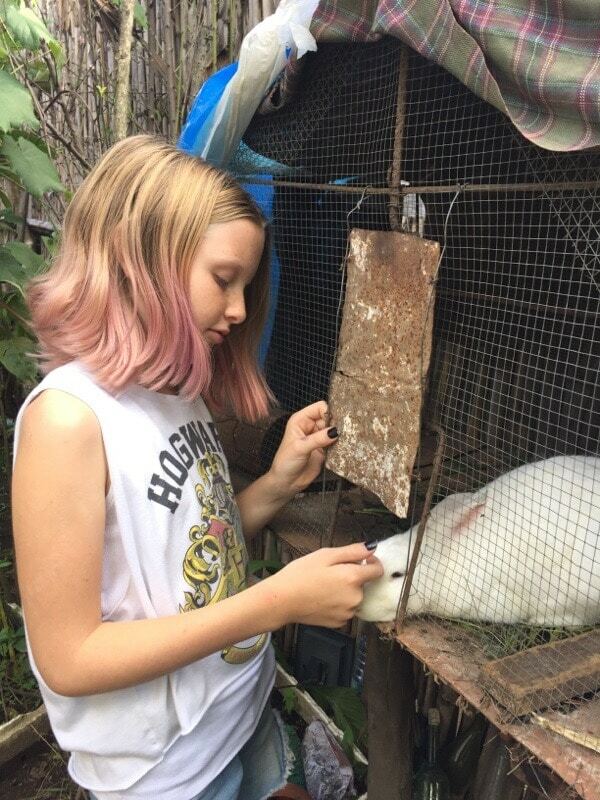 Zoe found the pet bunny. Of course. After a busy day we went out for dinner and by this time it was dark and there was a lot of traffic on the road. I did not like this but I’m getting better at my scooter so we set out, weaving in between buses and tuk tuks and cars and scooters! It’s never without adventure. During this outing Dan had a bit of an altercation with a old man on a bike. After doing a U turn, Dan was pulling over to the curb to park and probably cut in front of the biker, so the guy ran into him. This is all at a terribly low speed, if not almost a full stop. I wasn’t even stressed when I saw it, that’s how minor it was. But it was right in front of some cops. The cops pulled in and immediately the old biker guy started claiming extreme pain in his leg. Funny how he was standing up before the cops arrived but as soon as they arrived he seemed immobile. We are all not buying it and even the cops were rolling their eyes. They told Dan the old man wanted a little money for medical expenses so Dan gave him 300 quetzales ($36). The cops felt that was fine and just wanted to write down Dan’s name to make sure there were not other claims against him. We didn’t have any ID on us but a picture of Dan’s passport was enough. Meanwhile the biker man was desperately trying to find something wrong with his bike. He kept spinning his wheel and looking at it to find some imperfection. Even Haley said “It’s FINE!”. Then he started showing us his “nice Italian bike” which was so not true! Gosh it was funny. But after giving info to the cops they bid us good night and we went on our way and had a nice dinner. I don’t like scootering in the dark but I’m getting better at it. Oh, and we went down a one-way the wrong way and the cops had to tell us to turn around. 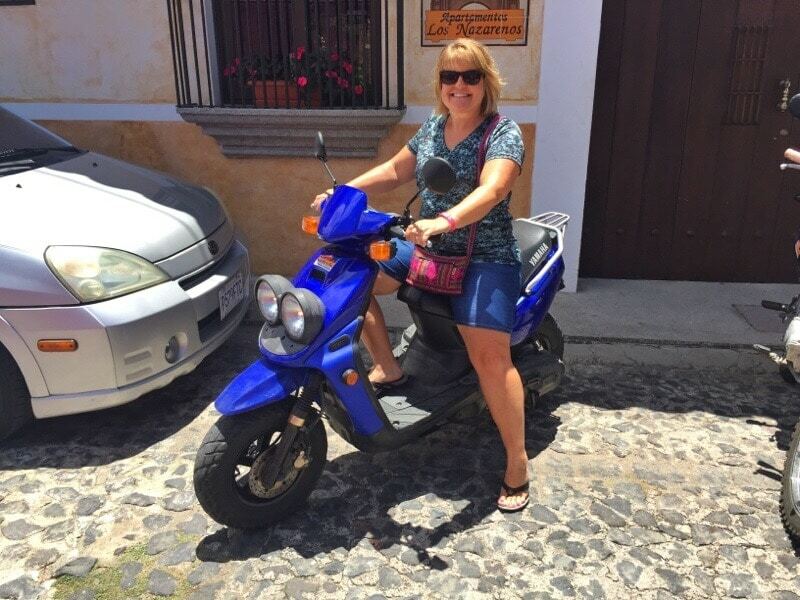 The cops are probably getting pretty familiar with the gringo family on scooters around town. So this week while we are oohing and aahing over all the back to school pictures on Facebook of our friends back home, we are down here having an education of our own, but in a very different way. They don’t teach you “how to cheat a gringo out of $36” in public school. I’m smiling because I’m not actually moving at this moment. The road is one of the best in town. I love your posts Alison! This was one of my favourites. I have never been to Guatelmala. It’s now on my list. Hi to everyone!